Travel back to renaissance Venice and become the most influential nobleman. 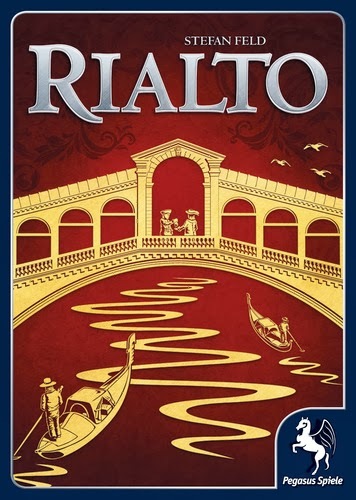 Rialto is a light strategy game from game designer, Stefan Feld. Light in that the game plays in less time than most Feld games. It does not mean that there are not many interesting decisions to be made. 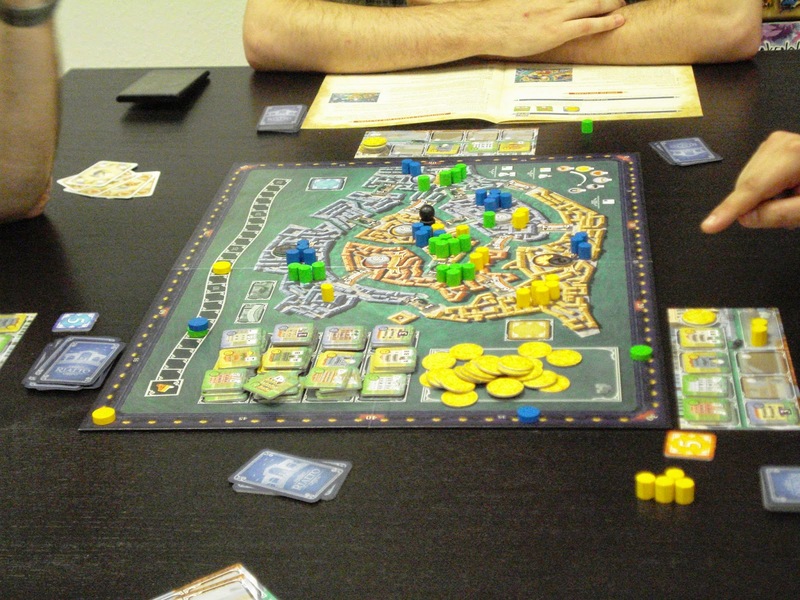 The game is an area control game set in renaissance Venice with its bridges and gondolas playing a significant role. The object of the game is to score more points than everyone else. Most of the points are awarded at the end of the game, calculated by who has the most councilmen in each of the 6 districts on the game board. Additional points are awarded for buildings constructed on each player’s individual game board. Lessor points are accumulated during each round for playing certain cards and activating certain buildings. The game is played over 6 rounds with each round featuring a section of the city up for grabs. Each round begins with players each drafting a hand of 6 face-up cards and 2 face-down cards from the draw pile. Then they discard down to 7 cards that they will play during the round. There are 6 types of action cards plus a set of joker cards. The cards are played in order with everyone playing any number of their Doge cards. Play proceeds next to Gold cards, then Building cards, then Bridge cards, then Gondola cards, and finally to Councilman cards. Each set of cards played allows the player to take a necessary action. The player who plays the most cards of a type always gets a bonus. There are 12 different buildings in one of 3 colors available to the players. Building cards are how players obtain the buildings. To activate a building cost 1 gold coin. Green buildings affect card selection. Yellow buildings affect card play. Blue buildings affect other buildings and can score points at the end of each round. There is too much detail to go in to the effect of each card or each building. Rialto is a game where the genius of Stefan Feld really comes through. Players never have enough cards, buildings or turns t get done what needs to be done. It simply must be played again and again. We have an open copy of Rialto available in our Demo Games Library for you come in and try.